I'm so pleased to have six new pieces, including mixed-media paintings and headdresses, included in British Invasion, a show of luminary British-born artists currently living and working in Southern California. From the MOAH Press Release, " Covering a wide career spectrum – from famed historically relevant artist David Hockney, to emerging artist Rhea O’Neill – the vibrant and stylistically varied work of these expatriates comprises British Invasion, MOAH’s next exhibition. 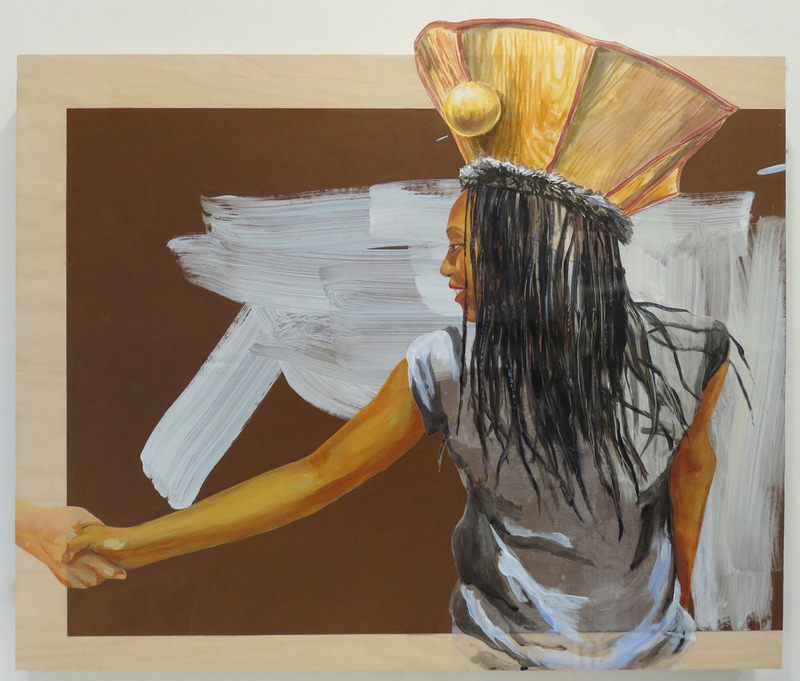 The new show will open November 19, with a reception from 4-6 p.m. to celebrate the artists. British Invasion will be on display from November 19 to January 22. For more information, visit www.lancastermoah.org or call (661) 723-6250 during normal business hours. MOAH is open 11 a.m. - 6 p.m. Tuesday through Sunday, and 11 a.m. - 8 p.m. on Thursdays. MOAH is closed every Monday." My father's studio was a hallowed place. Whether in a downtown apartment, in the country or the suburbs, I remember intense, preoccupied movements in his domain of creative production. I was practically born into his studio. He had been awarded the Guggenheim the year I was born so he didn't have to work a job, and my pram was apparently a fixture in the dining room studio of the drafty English farmhouse. I sometimes think I imprinted the smell of oil paint. In later years, we kids would be lucky enough to hang out, drawing nearby or poring through volumes of books on art, design and film, listening to records of Bach, his friend Gerry Mulligan or the Everly Brothers while he painted at his big easel. We'd gauge his mood by the set of his bearded jaw, in early days often with a pipe between his teeth. Then suddenly he'd yell, "Kids, OUT!" and we'd scramble for the door. As a teen, my dad tolerated my presence for longer stretches and even gave me my first painting lessons. By then he was listening to Elvis Costello and Bob Marley, and I turned him onto Patti Smith, who he respected for her poetry. A lover of literature, my father devoured books of every kind, read T.S Eliot to us at the breakfast table and later introduced me to Roland Barthes and James Joyce. Summers would find him outside painting landscapes that were somehow as psychological as his paintings of people, because whatever the subject, his connection was intimate. And he was always drawing. Black Rapidograph pens and black bound sketchbooks of every size and shape accompanied him everywhere, even in the pocket of his trench coat as he scribbled fellow passengers on the train to meetings with advertising executives. I don't know how many times he drew me, but I have quite a few pen sketches in which I look slightly bored and a little scared to move. Through the decades of our large, complex family's high points and tragedies, my father's art was almost another member of the family, accompanying our personal events with surprising points of view or looming presences. Not a location so much as an externalized state of mind, his studio was a psychic space for play, for the exorcism of demons, and where battles for beauty raged, revealing depths of pain and rejoicing. My father, W. Lee Savage in his studio, Sussex, England, 1962. In conjunction with the Mar Vista Art Walk I'll be opening my studio on Thursday, June 2, from 6-9 pm. Included alongside my artwork will be the brilliant artwork of Tom Miller. Please consult the Facebook event page by clicking on the link, or contact me via the contact page on this web site! The show opens with a reception on Thursday, March 10 from 6-8 pm, and the exhibition continues through April 14, Mondays through Thursdays from 11 am to 2 pm, and Fridays by appointment. Gallery location is 9200 Valley View, Cypress, CA 90630. In the studio I’ve been working on some new headdresses, which is both exciting and challenging. Here’s the newly finished Feral Girl headdress worn by Ellie. She collaborated with me on a photo shoot last week as I’m preparing for some new 2-D work. Her pet fringe lizard named Fred rode on her shoulder during the entire shoot – we’ll see if he makes it into the final piece! The challenges of working on these sculptural pieces are multiple. There are some issues of comfort and practicality, as in all wearable art, those of engineering (weight and balance, for example) and of mixing so many different materials. There is a lot of trial and error in the studio, and some days can be very frustrating. I’ve become reacquainted with my sewing machine, and I also find myself experimenting with different kinds of glue, wire and even tape, depending on which materials I need to put together. This week, I find myself itching to get back to making paintings and works on paper, modes of working with which I feel much more comfortable. At the same time, as my sculptural craftsmanship gets better, I’m encouraged to stay the course for the time being. 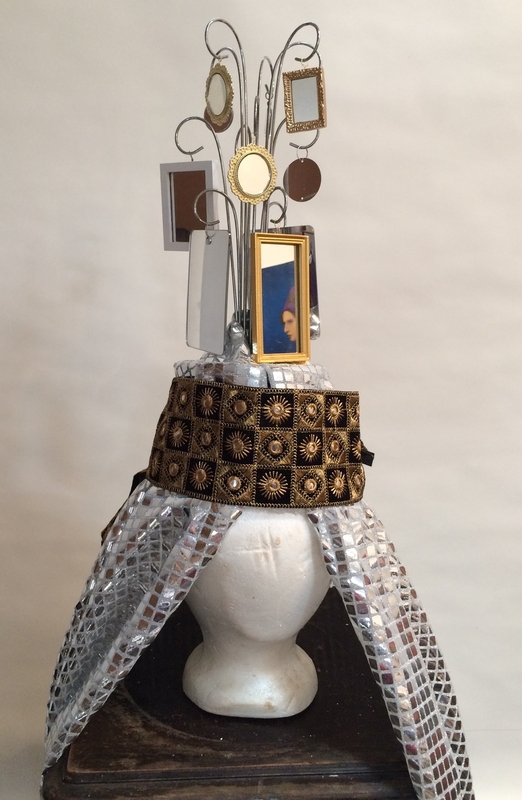 Mirror Queen, pictured right, below, is the next headdress in progress. This piece seems more Middle Eastern and less European, which pleases me as it fits with my intention to have a more diverse group of models for the coming series. Models wanted! Inquire within! Happy Spring! This is my new and improved website which is almost finished. Please have a look around. Leave a comment below or use the contact page to let me know what you think. 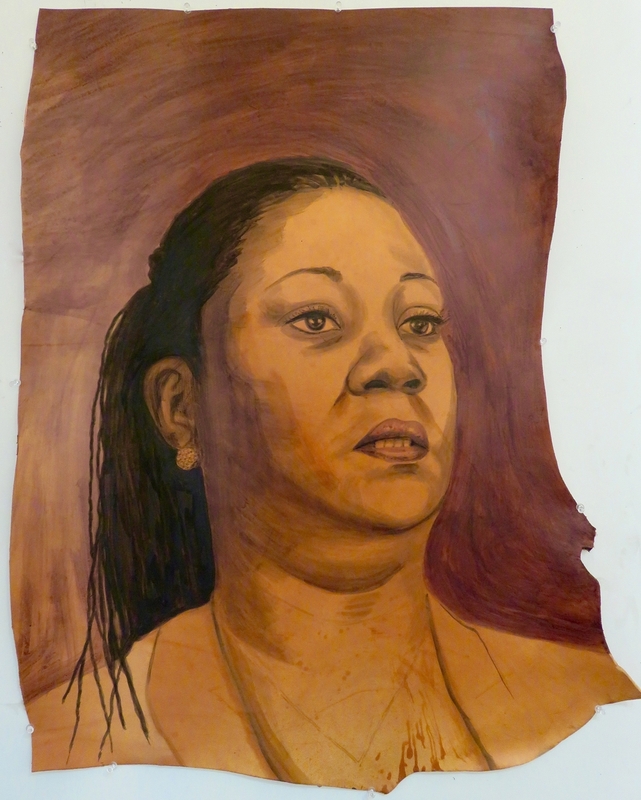 A portrait of the mother of Trayvon Martin. Established in Los Angeles for more than 20 years, Kate Savage is a visual artist who works with themes of folktales and personal history in psychologically-charged imagery. Her artwork consists of paintings, sculpture and works on paper. She has exhibited at Santa Monica Museum of Art, LACE, Riverside Art Museum, Torrance Art Museum, Haus Gallery, Ruth Bachofner Gallery, among many others.